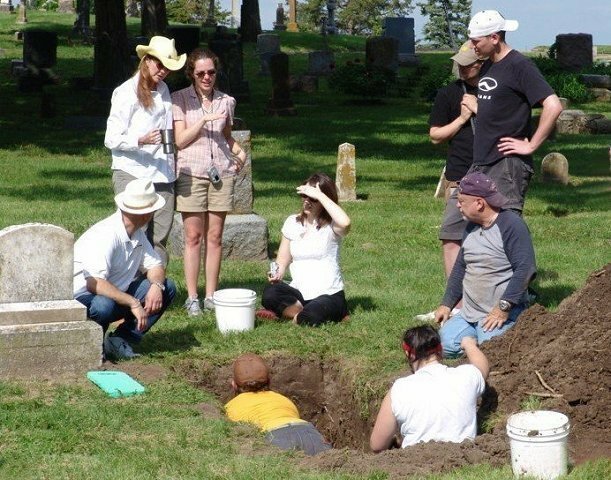 From left: Ernesto Acevedo-Munoz, Mimi Wesson (in cowboy hat), Andrea Viedt, Paul Sandberg (in grave), Katie Jackson, Sarah Garner (in grave) Lee Sarter, Mike Lawrence, Dennis Van Gerven (kneeling by side of grave). 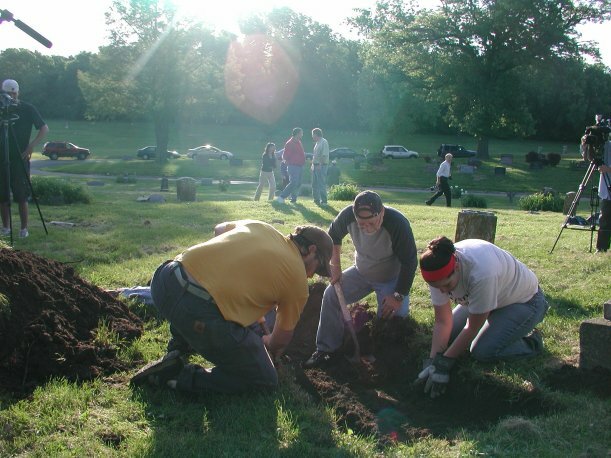 Lawrence, Kansas, May 19, 2006 : Our crew traveled to Kansas yesterday by car; there were nine of us, three faculty, five students, and my husband Ben Herr, who came along to provide some of the muscle we figured we’d need for the exhumation. (We were way right about that.) Dennis Van Gerven, director of the scientific part of the venture, brought along his graduate student Paul Sandberg. Ernesto Acevedo-Munoz, director of the documentary film we are making, brought along three students: Rachel Griego, Mike Lawrence, and Lee Sarter. Law student (and my favorite research assistant) Andrea Viedt shared a car with Ben and me. We were finally able to get a signal from an NPR radio station as we crossed the endless plains of Kansas late in the afternoon, and heard that the FBI was digging up ground on a farm north of Detroit, on a tip that they might find the remains of Jimmy Hoffa there. The similarity to our enterprise was amusing (for we were in a giddy frame of mind, and not disposed to be too solemn about the death of Jimmy Hoffa thirty years before), but also disquieting somehow. I think the students (who can sleep anywhere as far as I can tell) got enough rest Thursday night, but I know I was too excited and anxious to sleep for more than a couple of hours in our EconoLodge cubicle with its rackety air-conditioner. We assembled at the cemetery this morning at 7 am , and stood around the grave together for a moment. The sun was still low in the sky, and the grassy patch where we gathered was cool and shady. The grave was unmarked by stone or monument, but the cemetery superintendent Mitch Young had indicated it for us by outlining a long rectangle in orange spray paint on the green grass. 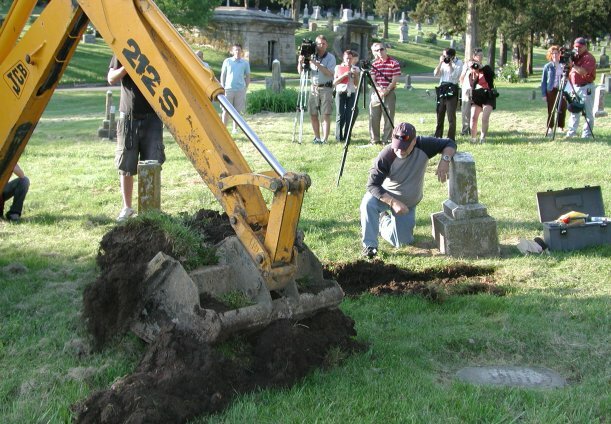 I thanked the dead man for what he was going to teach us, and apologized for disturbing his rest, and then Mitch started his backhoe and scraped a couple of feet of soil off the top of the grave. His skill was evident; this entire process took less than five minutes. After that the crew went to work with hand tools. 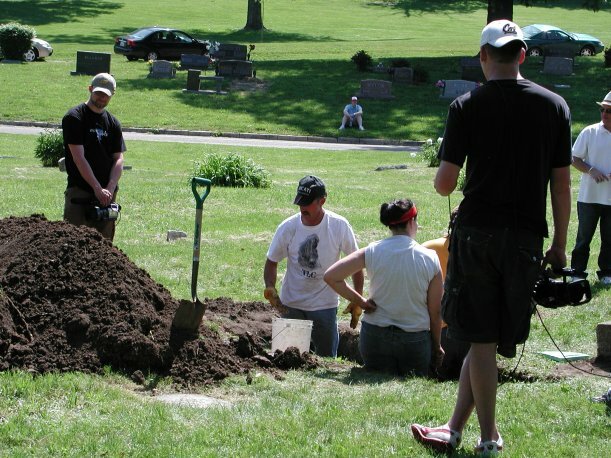 The crew inside the grave consisted of Dennis, Paul Sandberg, a KU anthropology student named Sarah Garner, and Ben. (Sarah was to graduate on Sunday, but had volunteered to spend nearly her last day as an undergraduate helping us.) We were joined at the graveside by my former research assistant Katie Tepley Jackson, who had first located the grave for me when she was a student. Katie now practices law in Manhattan, Kansas. The digging crew worked with shovels for a couple of hours, as the sun and the temperature climbed. There was a little joking (Ben reminded everyone to avoid saying things like “That’s a foot” in favor of the less alarming “That’s twelve inches”) but on the whole it was surprisingly quiet. Our film crew moved around the site with their mikes and cameras, and there were several television and newspaper crews around, mercilessly shushed and kept about twenty-five feet away by the City’s plan for managing the media. Someone had brought what looked like an eight-foot ladder, and every so often a photographer would climb to the top of it for a shot into the excavation. They continued to dig, the guys at the bottom handing out buckets of sloppy goo to be emptied, but an undeniable gloom had fallen over the scene. The sun had grown very hot, and the breeze had died, and even in the shade I was sweating. The lack of sleep and hunger were catching up with me, even though all I’d been doing was standing around watching and taking notes; small Midwestern bugs were beginning to find the backs of my knees. 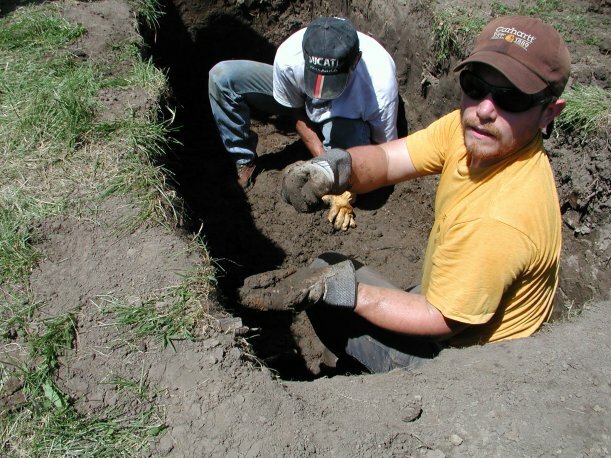 I knew the diggers must be getting exhausted and dehydrated, and I caught a glimpse of Dennis sitting down inside the grave, looking dejected and nearly dazed, mud smeared all over his face and his shirt and coated on the expensive watch he had not removed before climbing into the ground. The murky water was actually moving at the very bottom of the pit, flowing slowly into the excavation. We’re not going to find anything, I thought, not even a tiny bone fragment for DNA analysis, and although I believed I had prepared myself for this possibility, a huge wave of disappointment washed over me. 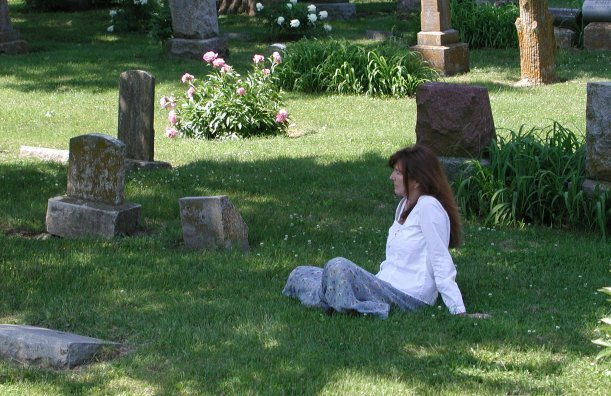 I sank onto the ground, leaning my back against someone’s headstone and considering how things would go from here, and whether I could find something good in this outcome. Time seemed to stop altogether; nobody seemed to be doing anything except for the bugs, who were very busy. orange shirt), Mike Lawrence, Ernesto Acevedo-Munoz. I had to sit down again, my heart was thumping so, and then had to stand up again right away because I couldn’t be still. Dennis and Paul were examining a gritty piece of matter that looked like a twig. “Yup, it’s bone”, I heard Paul say (Paul is one of the calmest guys I have ever met) and that’s when I knew that we were not going home empty-handed. The bones kept coming after that, and then some teeth. Paul and Dennis handed them out to Sarah, who bagged them after gently wiping some of the mud off. By 2:15 , there were about twenty of them, and a couple of teeth. I had to leave about then, as the City’s press officer had promised that we would hold a news conference at three on the University of Kansas campus. I remember very little about the event, only thinking that I had to be the filthiest, sweatiest person to ever speak at a press conference in the history of press conferences. And being asked if there were any preliminary findings. “Which man is younger?” asked somebody. “Maybe,” I said. “We’ll have to wait for the final results.” But I knew these findings were not promising for my theory, and that I’d have to come to terms with the possibility that all my work and all of my carefully structured deductions had deceived me. Oh, and one other thing I remember about the press conference: Leray Hillmon showed up. I took one look at the tall man standing in the back of the auditorium and knew who it must be: he was a ringer for John Wesley Hillmon. The desire Dennis harbored to identify the remains by facial reconstruction or by measurements of the pubic bone was not fulfilled. The remains are far too fragmented for those old-fashioned techniques. But we have hope for the classic 21st century forensic technique: DNA matching. 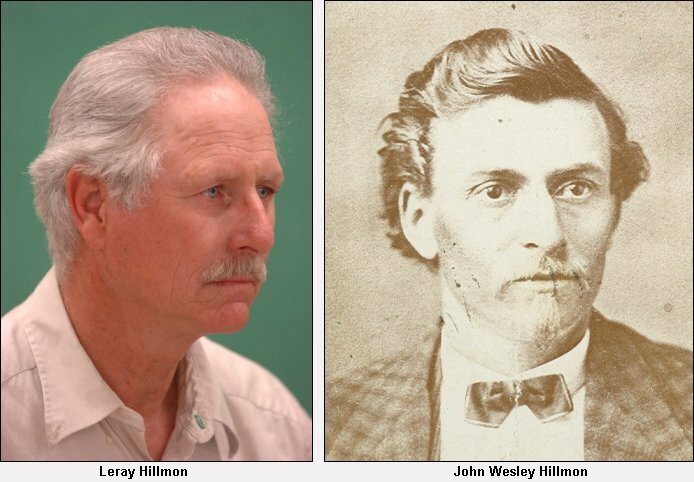 We don’t have any of John Hillmon’s (or for that matter Frederick Adolph Walters’s) DNA, of course; we haven’t been lucky enough to find a toothbrush or lock of hair belonging to either man. But we have found, thanks only to amazingly good luck, something nearly as good. I had dinner last night with Leray Hillmon. The genealogical search we commissioned so long ago ought to have discovered Leray, but it didn’t, probably because in the census records the family name was sometimes spelled Hillmun or Hillman. Our genealogist did locate two descendants of Frederick Adolph Walters, Dan and Kim Davis (father and son) of Spokane, Washington. 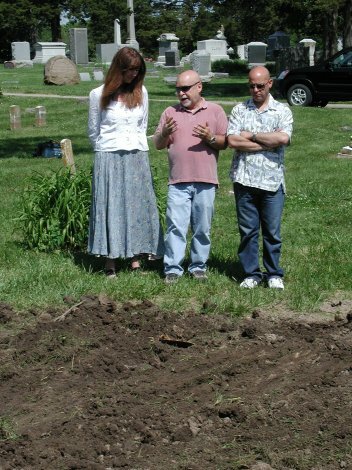 Dan and Kim were enthusiastic about the exhumation effort, and even joined us as petitioners when we sought the court’s permission to disinter the remains. And Dan has generously donated a DNA sample to compare to the remains, but that comparison is unlikely to be productive because he is in a broken male/female line of descent from F.A. Walters. Given the state of the remains, without Leray the Davis DNA comparison would have represented our only very slender hope for a positive identification. But with Leray it’s a different story. Leray is the paternal grandson of a man named George Benjamin Hillmon. George Benjamin was John Hillmon’s half-brother; the two men had the same father. What this means is that Leray, a witty and gregarious truck driver from Montana, carries the same Y chromosome as John Hillmon– they are both in the direct male line of descent from that father, Benjamin Hillmon. Before we left the lab for the restaurant, Leray gave us a gift: he spit into a paper cup. Dennis will carry this specimen back to Boulder, along with some bone tissue from the grave, and ask our colleagues in the molecular biology department extract DNA from the saliva and the bone, to see if the Y’s are a match. If so, the remains belong to John Hillmon; if not, they don’t. We didn’t find Leray; he found us. 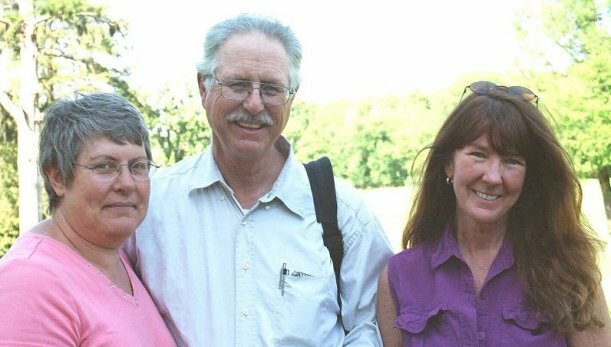 His wife Sandra, who had been researching her husband’s family history, heard about our project from an email correspondent in Barber County, Kansas, where some local historians have posted a lot of information about the Hillmon case on the Barber County, Kansas: History & Genealogy website. Sandra sent me an email about a month ago, and if she hadn’t, we would be leaving Lawrence a very dejected crew. She and Leray, who drive a long-haul semi-trailer for a living, had arrived in Lawrence early in the day on Friday, but it had taken them several hours to find a place to park their truck. That’s why we met for the first time at the news conference. With Leray’s spit safe in its cup, we can return to Colorado with high hopes. Tonight Ben and Ernesto and I drive to Kansas City to take our wonderful attorney Mark Thornhill and his wife Maria Donigan out to dinner. It’s about the only thanks Mark will get from us; he and his firm and his associate Mackenzie Murphy-Wilfong did nearly $20,000 of legal work for us pro bono. Another couple of people without whom this project could never have been accomplished, Mark and Mackenzie must know more about the law of exhumation now than anyone in the country. They’re probably hoping they never have an opportunity to employ this knowledge again. Sunday, May 21, Lawrence: We returned to Lawrence about ten this morning after a wild night in KC, where we had managed to get lost for a little while a little after dinner, driving through streets jammed with spectacularly dressed vogueing couples and intricately tricked-out vehicles. Some contrast to the quiet sunny cemetery back here where we assembled at graveside for the last time, for a few words of thanks and farewell. The motley character of our assembly (for in addition to our crew Leray and Sandra were with us, as well as Mitch from the cemetery and a few of the most faithful journalists) put me in mind of Kurt Vonnegut and the theory he sets forth in Cat’s Cradle — a theory Vonnegut attributes to Bokonon, teacher and religious leader. There are, he says, two sorts of human organizations. If your life seems to be tangled up with someone else’s for no logical reason, Vonnegut says, that person is probably in your karass. As Bokonon observes: Nice, nice, very nice; So many different people in the same device. The karass, a creation of God (or fate, if you like that better) is not to be confused to the other sort of organization, a granfalloon, a grouping that has nothing to do with God’s purposes (or fate’s) and everything to do with man’s. Vonnegut’s examples of granfalloons include the Communist Party, the Daughters of the American Revolution, the Odd Fellows, and “any nation”. But on this morning I had more in mind the University of Colorado, the City of Lawrence, and the federal judiciary, by which I meant no disrespect to any of these fine organizations, only that nobody would mistake them for a karass. So because this was on my mind and because I believed we ought to say a few words, I told those assembled, and the one whom we were assembled for, about how we seemed to me to have become (or, Bokonon would say, always to have been) a karass. And I thanked him, whoever he might be, for what he had permitted us and taught us, and for what we hoped to learn from him in the near future, but especially for allowing us to realize that we belonged to his karass and so to each others’. And then Dennis spoke, and said that there are two tragedies: to be forgotten, and to be misremembered. “It’s wrong,” he said, “to be remembered as a scoundrel if you weren’t, or a victim if you weren’t. We hope to ensure that you will be remembered for who you were.” Dennis nodded toward Mitch to indicate that was all he had to say. Sorrow for the man dead for these hundred and twenty-five years took me by surprise. My hands were too dirty for wiping my eyes and I had no handkerchief, so the tears slid down unhindered. And then Ben, who was the only one who had remembered to wear boots, climbed back into the muddy trench and gently tipped the fragments of John Hillmon, or Frederick Adolph Walters, or some other wayfarer, into the gray water, and then he and Dennis and Paul each tossed a handful of earth into the pit. We all stood back and Mitch went to work again with the backhoe. It was shocking how quickly the ground was restored to its contours. Within ten minutes, another cemetery worker (Frank, he told, me, for I had asked him his name in case he was in the karass too) was leveling the last uneven hills with a rake, and then he finished and walked away too and it was done. We weren’t meant to leave town until the next morning, and had a dinner to go to that night at the home of Dennis’s generous colleague Dave Frayer, whose lab we had used yesterday. But in the meantime we didn’t know quite what to do with ourselves, and so we stood around the green, green cemetery for quite a while, until the day grew too warm for that and we dispersed back for naps or late breakfast or a place with wireless service so we could check our email and find out what had been going on while we had been looking at bones. The bones, Bokonon would say, are the wampeter of this particular karass, the object about which it revolves. In particular, our wampeter is the shoulder bone that Dennis and Paul have chosen as the likeliest to yield DNA, the one they have wrapped up and labeled and secured in the glove compartment of Dennis’s truck. If this were a bad movie, the truck carrying the bones would be destroyed in a flaming wreck on its way back to Colorado , and the mystery of the Hillmon case would never be solved. But this isn’t, and it won’t, and I’ll tell you more after we have interrogated those bones. May 30, Boulder : The FBI reported today that it is ending its search for Jimmy Hoffa’s remains on the Michigan farm. The cost of the search has not been reported, but it was said to take a couple of weeks and involve more than 40 FBI personnel, along with demolition experts, archaeologists and anthropologists. Dennis, having looked harder at the teeth, says that he finds wear patterns on the occlusal surfaces that suggest an older person. More likely someone in his thirties than twenties, he tells me, if he had to guess. But he’d rather not guess. Wouldn’t stand up in court, he says, looking at me sideways like this is a joke that an attorney should get. It’s the DNA that will tell the story. Ken Krauter, the biologist who’s going to run the DNA for us, is out of town, and by the time he gets back to his lab Dennis will be gone for a week. We’ll have to wait until the middle of the month to even start the analysis. It’s like waiting for Christmas. I’m going to have to be very good.